| caption = Know-Nothing Party ticket naming party candidates for state and county offices. At the bottom of the page are voting instructions. Know-Nothing Party ticket naming party candidates for state and county offices. At the bottom of the page are voting instructions. Nationally, in 1856, the American Party ran Millard Fillmore as its candidate for President of the United States. While Fillmore finished last, he still received almost 900,000 votes out of the approximately four million votes cast in the election. Although many Americans, including some Ohioans, opposed the Catholic faith and lived in fear of immigrants, slavery and its expansion was a more important issue to them. The Know-Nothing Party refused to take a stand on slavery. 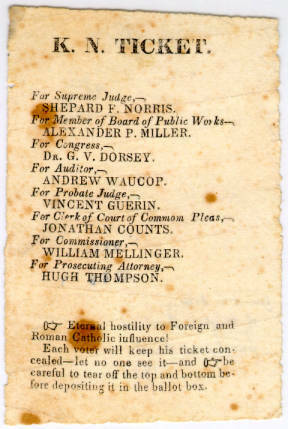 As a result of the party's refusal to take a position on slavery, the Know-Nothing Party was declined by the presidential election of 1860. The party did not run a candidate for president in this election, as many of its followers had joined the Republican Party.